Taking art to Antarctica is reminds us of its frozen seas, its species, and its icebergs, and how important they are for the terrestrial ecosystem. The last two decades were probably the warmest in the last five centuries. The biggest changes are related to the disintegration of the A and B sectors of the Larsen Ice Shelf. When these ice shelves receded, an extraordinary treasure of ten million specimens was revealed beneath the Weddell Sea, on the coast of the Antarctic Peninsula. Photography, video, installation and performance. Story: The last two decades were probably the warmest in the last five centuries. In 20 years there have been changes in the glaciers and the ice shelves in the Antarctic Peninsula brought about by the atmosphere and ocean warming. The biggest changes are related to the disintegration of the A and B sectors of the Larsen Ice Shelf. Due to the disappearance of these ice shelves, an extraordinary treasure of ten million specimens has been found in the depths of the Weddell Sea, on the coast of the Antarctic Peninsula. This ecosystem, that had remained stable under a layer of ice for the last thousand years, is being exposed after the collapse of over 10,000 sq km of ice in the last 15 years due to the increase of the temperature in the wake of the climate change. The light is so intense and bright that it modifies the colors throughout the day, while the horizon line blends into a white plane where the sun bounces and never sets. A deep and vivid feeling seizes us when, at the end of a long voyage, we step on Antarctic soil, a soil covered with fossils. As sea, rock, and time, Antarctica is today the largest natural freshwater reserve for humankind. Being there is to witness a different world on this very same planet, to venture into the wilderness, into a new place that cannot compare with what we already know, with no schedules, no currency, and without the facts of everyday life. We must adapt to the weather and the severity of the freezing gales, where the beauty of the vastness of space and the extreme temperatures are both juxtaposed. A virgin continent operating as an experimental laboratory in every discipline, naturally including culture and art. Our way of thinking changes in Antarctica, which thus becomes an ideal place for the artist's task. Methods: The project I conducted in Antarctica with video installations, photos, and performances in the course of nine expeditions ponders on the effects of climate change on the Antarctic Peninsula and is based upon the research of scientists from the Direccion Nacional del Antartico (National Antarctic Affairs), regarding, for instance, the presence of methane gas and the disappearance of ice shelves. The idea was to take art to Antarctica and develop short-lived sites-specifics as a praise of sorts, displaying a peaceful presence. And once the exhibition came to an end, the biosphere was to be left just as it had been found. The only trace/work that has remained is a series of video and photographic records plus the recollections of the inhabitants. I attempt to ponder on the calving of large masses of ice due to global warming, on the damage and indifference, on the art from the extremes. Let us imagine ever-lasting icebergs, fossilized remains, zero pollution, expeditions and challenges in a continent of cooperation destined for peace. 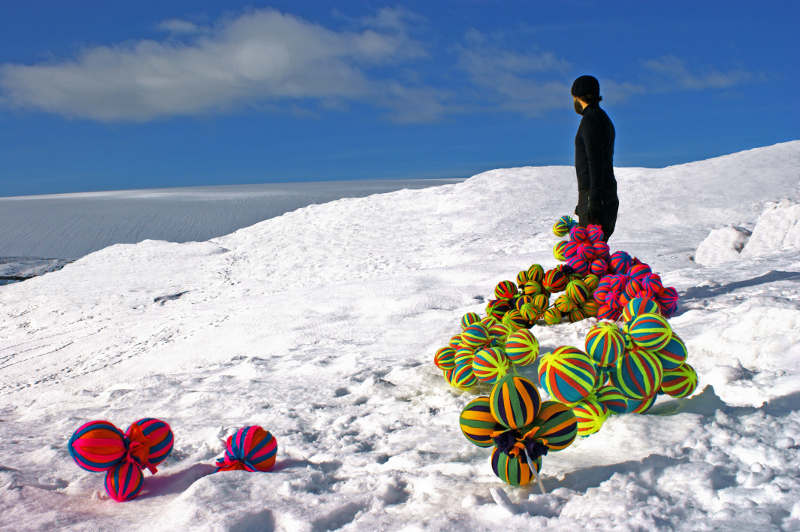 Taking art to Antarctica is to remind the world of its frozen seas, its species, and its icebergs, and how important they are for the terrestrial ecosystem.